Comments From the Artist: I love nature and this is where I find inner contentment. I am now retired and decided to make cards and prints of my paintings I welcome your comments as I really want to learn more. Thank you for taking time to review my work. Beautiful work….the warm feeling of the late-day sun is very powerful. I can’t explain why but I think the painting would be more effective if the weed-bed low centre offshore were gone. I’m not sure but i think it bothers the eye flow around the painting but maybe it’s just me. Lovely work….looks much like the countryside up here. Loved the colours of this painting. In my mind’s eye I could image a lone wolf in the foreground, head raised, jaws open in a cry to the wilderness. Beautiful colors, very serene. I would hang it in my home. Great work. Beautiful work, June, especially the foreground! Might be better if the background horizon was level, instead of dipping on the left. Hi June, I’m new here and new to painting. I wish I had some good advice for you. I love your painting, the color is awesome please keep up the good work. I like the colors also. Very well done. Different with the warm colors. I feel you need something in the middle there (duck?) as a focal point. Just opinion. Like it. I love the overall feel to the painting – the sky and water is well done. My only criticism is that when painting land with water in front – it looks best and more realistic if the line is horizontal. Also if the water is still – wouldn’t there be a reflection of the land on the water too – not just the tree sticks? The trees in the foreground and the rocks are really good. 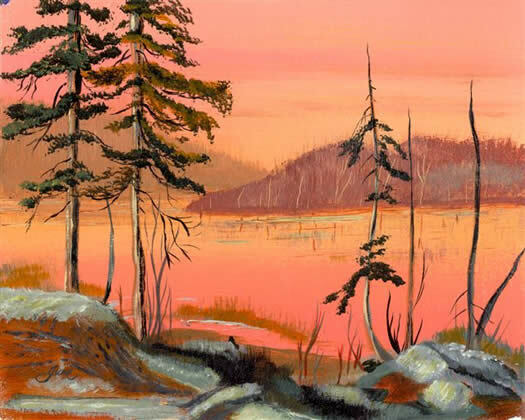 Hi June, we love the colours, such a beautiful painting reminds me of the Group of Seven artist’s which is a very positive thing. I don’t know anything about art so no advice from me. I just know when I love something and I definetely love this piece and I could just stare at it forever. Good luck and keep up the great work. The title of this painting certainly conveys the feeling that you have captured. It is PEACEFUL and your use of the warm color to capture that late afternoon glow is very well done! I would like to make a few suggestions. For more drama in a painting, it is best to place the horizon line either above or below the mid point of your canvas. I feel that by lowering the horizon line to give us more of the sky “shape” in your painting, would provide the viewer with a nice background shape to show off the textures you used in those foreground tree shapes. Also by lowering the horizon you would not have all of that middle “water area” in your painting. It would be a narrower more interesting shape of water. The shapes in the foreground of your painting don’t bother me, but it is the use of white on these shapes that does not seem to go with the rest of your warm tonal painting. If those white shapes would be a warmer tone (incorporating some of that warm color used elsewhere in your painting into the white shapes) the painting would feel more connected. Sometimes as artists we need to substitute those things that nature has given for things that will make for a better painting. I am not sure if the white shapes are snow, but warming up these shapes to be a part of the overall warm tone of the painting would not draw attention to these shapes but connect them to the whole. Thank you for sharing your work with all of us. Keep practicing and keep painting! This is a beautiful painting, best I’ve seen in here! Thanks! Hi June. Are you the June Smith who painted a portrait of my late grandfather, Syd Sunderland? I FIND YOUR ARTWORK VERY RELAXING, IT LEAVES YOU WITH A VERY CONTENT FEELING. GOOD WORK. I just stumbled across this page .. It is many years old now – back when I was living in the country — had computer problems and no one to help me out there — still not very bright — living in the citly — Is the group still active ? Yes, still active June! Be sure to visit my facebook page as well: http://www.facebook.com/artinstructionblog. You can post art, ask questions, comment, etc.